Simple IP/IP Range Ping is a lightweight utility to ping a range of IP addresses, in order to check the connectivity. It is packed with a wide range of features that can be used by all kinds of users, regardless of their expertise in networking tools. As there is no installation required, you can simply save the executable file anywhere in the hard disk, as well as drop it on a USB drive, in order to run it on your computer. This is really helpful for network administrators, however, they must have .NET framework installed on their PC. What’s worth considering is that the Windows registry files do not get updated with new entries, and no additional files are built without your consent. Thus, the IP tool and scanner does not leave any traces after you delete it from your system. Considering the technical nature of the Ping utility, it does not put too much stress on look and feel of the interface. All important options are available on the main window, and you can scan IP ranges by indicating the start and end IP addresses, along with the time delay. You can even tell the IP ping tool not to fragment the hosts, and also configure the TTL, buffer and delay. The total scanned, opened and closed hosts are displayed in the status bar. This list of hosts can be exported to a .TXT file for deeper analysis. Apart from this, the program has a dedicated function to convert DNS addresses to IP format and vice-versa. Simple IP/IP Range Ping, however, hogs system resources and makes the response time slower for other applications. It also includes a help file for beginners. 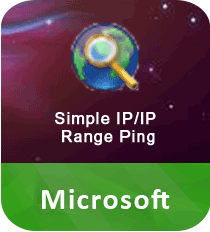 Download Simple IP/IP Range Ping to scan multiple IP addresses at the same time. IP Range Ping simply pings each IP address and shows the number of successful and failed pings, along with the average time taken for each ping. All in all, it is a simple yet effective program to ping a single IP address or a range of IP addresses simultaneously.